Over on the Paper Artsy Blog there is an awesome challenge based on the use of fabric. I was so inspired by the many beautiful examples of textile art on the blog. My favourite, of course, were the fabric books by Frances Pickering and DJ Pettitt. You can check them all out for yourself here on the Paper Artsy Blog. I decided to create a fabric card using flower stamps in different ways. I used the flower, leaf and moth stamps from Paper Artsy's Hot Picks HP1004, HP1008 and HPXT02. The quote is from Squiggly Ink Crowns and Castles SICC7. I also used some dies: Grunge Flower #1 and Grunge Flowers #2 and #3. I coloured my card with Distress Inks and Stains. Here I have simply stamped the flowers onto coloured fabric backed with a light weight iron on interfacing. I have padded them with wadding and stitched around them. I gathered the centre of these flowers after stamping them on fabric and cutting them out. These flowers were made from the largest flower stamp, gathered around some stuffing and stamens. I used jewelry findings to finish them off. The little berry flowers were made by cutting flowers using the dies and colouring them with Perfect Pearls for some glimmer. See my Technique Tutorial to learn about colouring fabric with Perfect Pearls. The edges were gathered around some stuffing. I stamped the moth on the background first and then onto coloured fabric backed with interfacing. I cut it out and glued it over the stamped image. The inside is plain with a verse and space to write. I used printer paper, scrunched, ironed, inked and fused with fusible web. I stitched around the outer edge. The back of the card is decorated with a plain inked background to match the cover. This is gorgeous Julie, I love your flowers, and your choice of palette. Congrats on winning at Paper Artsy - you deserved to win- it's gorgeous! Welcome to my blog. My faith, family and creativity are the most important things in my life. The Bible is my greatest inspiration and I love to express my faith journey through creativity. Being a Stampin' Up! independent demonstrator has allowed me to learn and teach new skills with beautiful, high quality products to take my creativity even further. It also gives me opportunities to express my love for others by creating thoughtful hand made gifts. Follow my artful expressions of faith here. Technique Tutorial-Perfect Pearls on Fabric. 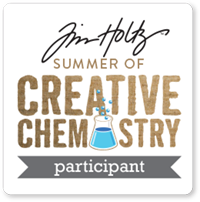 Summer Of Creative Chemistry - Week 1 Challenge.